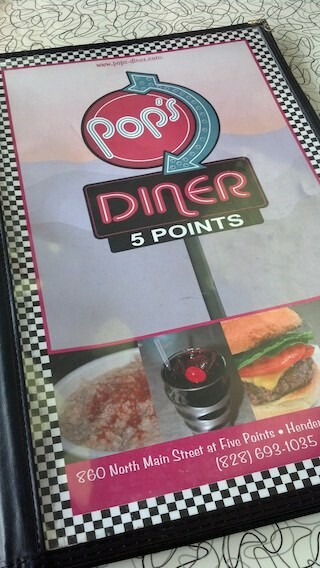 Pop’s Diner is an awesome 50’s diner located in the 5 Points area of Hendersonville, NC. It’s an iconic landmark and the oldest/longest running restaurant in the area. That makes it worth a visit in my book. Great Signage draws you into the restaurant and all the decor inside and outside are in keeping with the wonderful 50’s vibe that they have created. 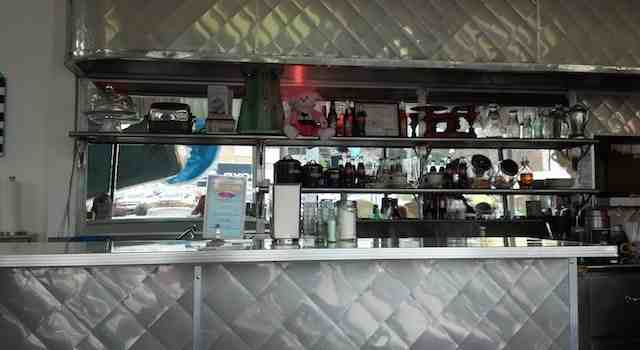 When you step in youwill be transported back in time with the wonderful 50’s diner decor. Pop’s is a bright combination of hot pink and turquoise. They have pink and white polka dot walls and turquoise chairs and booths. 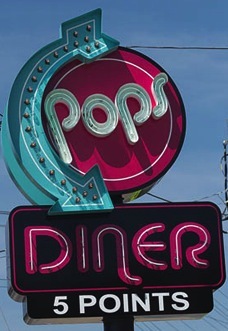 A bright neon sign with an arrow that circles the word “Pop’s” and points to the word “Diner” also features the colors. They’ve done a great job with the decor theme and even the wait stafft and play the part with their hot pink shirts and fun attitude. 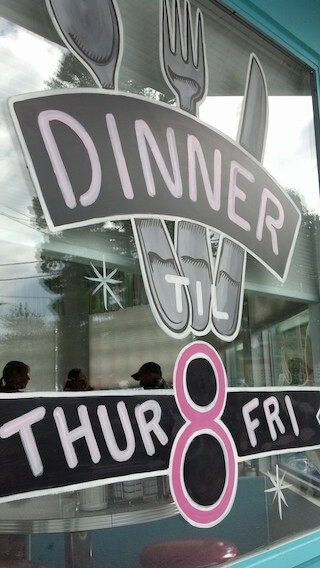 They have great, diner-style, comfort food and good service. The portion sizes are big and the prices are reasonable which make this a must-try, hot spot. Everything we’ve had has been delicious. Favorites include: the Club Sandwich, Potato Pancakes, Burgers and the Philly Cheese Steak. Lisa Duncan is a 25-year Advertising and Marketing veteran who proudly worked on some of the biggest brands and mightiest small businesses on the planet -- Publix Supermarkets, Outback Steakhouse, Buffalo Wild Wings , Costa Rica and Orlando Tourism to name a few. Her award-winning expertise is now brought to bear as a consultant and freelancer. She's a clogger (yep), blogger and outdoor enthusiast. An avid adventurer and dog lover at heart. She hikes, bikes, kayaks, zip-lines, white water rafts and has even been known to jump out of perfectly good airplanes. She loves exploring everything from state parks to trails off the beaten path and then shares her experiences on AroundLakeLure.com, the website she founded in 2013 when she moved to beautiful Lake Lure, NC.